For tackling messes on hard flooring (like hardwoods, tile, laminate or vinyl) a robot mop can be hard to beat. 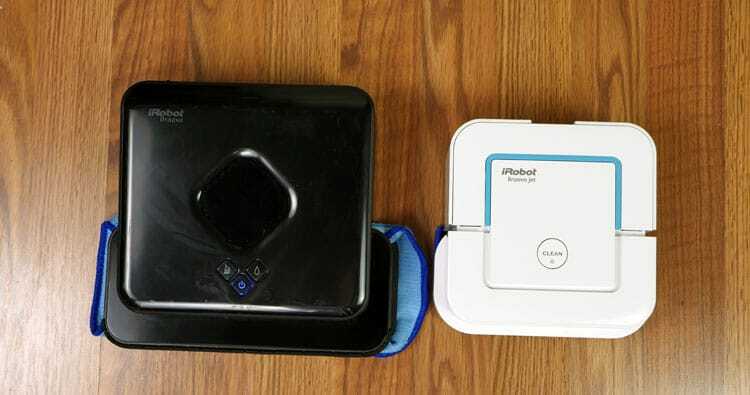 Today’s comparison is a head-to-head match up of Braava Jet 240 vs. Braava 380t robot mop. Both of these mopping robots are produced by iRobot, the same manufacturer of the classic Roomba lineup. Dusting Coverage: 1,000 sq. ft.
Mopping Coverage: 350 sq. ft.
Dusting Coverage: 200 sq. ft.
Mopping Coverage: 150 sq. ft. Think of the Braava line as a “cousin” to Roomba. Same company, similar interface, brand new technique. Compare these top robot mops today and see if a mopping robot is a good choice for you. We’ve been using both the 380t and Jet 240 in our testing home for 9 months. In general, I still really like both robot mops. However, my love for the Braava Jet 240 has definitely grown. The Braava 380t really needs its navigation cube to be properly placed within the room to function properly. Otherwise, it will stop every 30 minutes or so after cleaning the immediate area. The Braava Jet 240 on the other hand just keeps going and going. It cannot cover quite as much ground on a single charge, but the beauty of the 240 is it needs no baby sitting. It just keeps cleaning further and further until it runs out of battery. With respect to both the 240 and 380t, I feel like Roomba’s mopping coverage specs are very Conservative. In my experience, the 240 regularly cleans 200-300 sq. ft. on a single charge, while the 380t cleans closer to 500-700 sq. ft.
From the makers of the Roomba, iRobot also has a small lineup of mopping robots. The Braava mopping robots are designed to tackle messes on hardwood floors, tile, laminate, or any other indoor hard surface flooring. Unlike Roombas, which rely on a centrally located bristle or rubberized brushroll, these mopping robots use liquid cleaner and a microfiber pad to get the job done. At a high level, the Braava Jet 240 is the step down from the Braava 380t. It has simpler features and a shorter run time, but also an enticing lower price tag that could be a deciding factor if you have a smaller home or a simpler layout that you’re trying to clean. 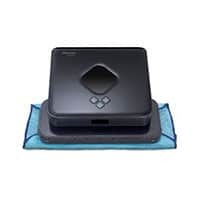 On the flip side, the Braava 380t is a smarter robot mop, has improved navigation, and is designed to tackle larger spaces (capable of cleaning up to 1,000 square feet per cleaning cycle when sweeping or 350 square feet when mopping). This is double the mopping coverage of the Braava Jet 240 and quadruple the sweeping coverage. But those aren’t the only differences. Let’s jump into the full comparison of Braava Jet 240 vs. Braava 380t below. 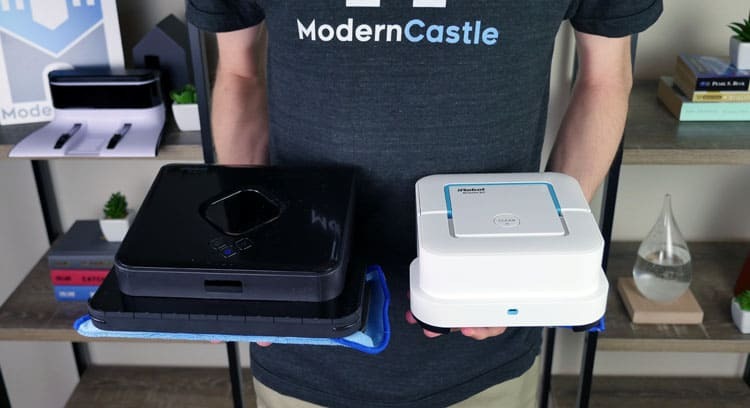 The Braava Jet 240 and Braava 380t are both great options for an automated mopping robot, but they’re designed for different tasks and audiences. Check out the table below for a quick head-to-head summary between the two robot mops. Weight 4 lbs. 2.7 lbs. Sweeping Coverage 1,000 sq ft. 200 sq ft.
Mopping Coverage 350 sq ft. 150 sq ft. The aesthetic design approach of the Braava Jet 240 and Braava 380 is as different as night and day… literally. The Braava Jet 240 has a modern white body with minimal teal accents like something the Jetsons would have, while the Braava 380t sports a classic all black body, like something James Bond would have. No matter which character you more closely identify with, both of these robot mops are designed for quality liquid cleaning. Both Braava models also are designed with onboard controls, although they vary slightly based on each model. The Braava Jet 240, for instance, has a single, simple “CLEAN” button, not dissimilar from the style of button you’ll find on the Roomba robot vacuums. The Braava 380t has three buttons, by comparison. The design is slightly different here since the 380t’s, buttons are used to actually select the style of cleaning you’re looking to do. There is a simple power button, a button for dry sweeping, and a button for damp mopping. The Braava Jet 240 does not require three buttons since the system detects which kind of cleaning it’s doing based on the cleaning pad that is inserted. Both mopping robots are also designed with an on-board tank which you can fill with branded cleaner, your own homemade cleaner, or even just water, depending on preference. I tend to use a mix of 1 part vinegar and 5 parts water. The Braava Jet 240 has a tank capacity of 0.15 L, while the tank capacity of the Braava 380t is slightly smaller at 0.12 L.
RELATED – What’s the best robot mop? Modern Castle answers! The cleaning style of the Braava Jet 240 vs. the Braava 380t is quite similar. Both robot mops use similar parts and procedures in an effort to produce similar results. But how do they really compare? Charge the robot in the space you want to clean and simply press clean when you’re ready. The robot mops will both navigate the space (albeit the navigation technologies are different) and will stop when the area is clean (or the battery is dead). How long can they clean? During my extended cleaning tests, the 380t’s battery would allow it to complete three full mopping cycles. I was a bit surprised, as this was 2-3x the floor coverage that the specs say it’s capable of. The Braava Jet 240 was more true to specs. It could only clean a couple hundred square feet (usually one medium sized room) before it needed to be charged again. The Braava 380t needs to be manually placed back on the charger when it’s done, and the 240 Jet needs to have its removable battery placed in the wall charger. 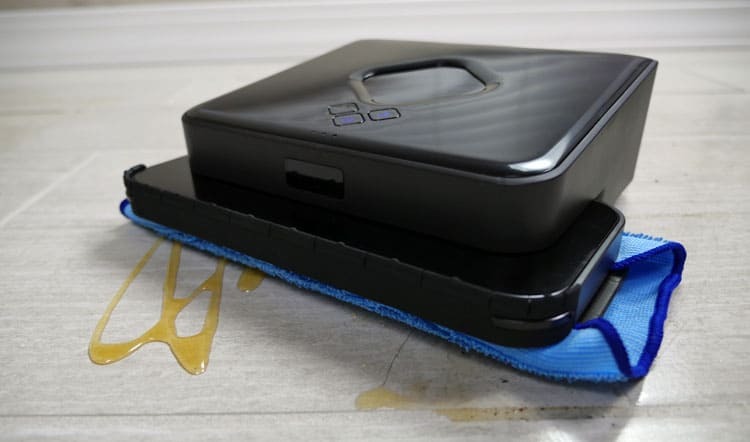 The Braava 380t and the Braava Jet 240 employ a Triple Pass cleaning technique for wet mopping. This means that as it cleans, the robot moves in a series of forward and back motions, increasing the chance of cleaning stuck-on messes. For dry sweeping, these mops use a Single Pass technique; for damp mopping (not as much liquid as wet mopping), the Braava Jet 240 uses a Double Pass cleaning technique. Note: The Braava 380t only has a dry sweeping or wet mopping mode. The Braava Jet 240 has three modes: dry sweeping, damp mopping, or wet mopping. Both the Braava Jet 240 and the Braava 380t use removable cleaning pads. The pads that come with the Braava Jet 240 are disposable and slide into the bottom of the unit. However, you can buy washable cleaning pads (which I did, they are an absolute must, in my opinion). The pads that come with the Braava 380t are microfiber and are machine washable. The Braava 380t cleaning pads use a Velcro-like attachment to wrap around the cleaning head. The navigation capabilities are also different between these two mop models, and it’s one of the biggest differences between the models. For navigation, the biggest difference comes in the form of a little black box—the Northstar. The Northstar navigation cube only comes with the Braava 380t, but really provides an advantage when it comes to navigation. With the Northstar, the Braava 380t is able to constantly determine its location in reference to its proximity to the Northstar. This helps to make sure the Braava reaches all areas so it can focus on providing a quality clean. So how does the Braava 240 navigate? With the Braava Jet 240, it uses iRobot iAdapt 2.0 navigation. This provides it with the ability to remember obstacles and also set virtual walls to keep it in specific rooms (or just away from more sensitive spaces. If you’ve got a smaller area, advanced navigation may not be something you even notice; however, for larger spaces, the Northstar of the 380t can be a real difference maker. Regarding size, the Braava 380t is actually considerably larger than the Braava Jet 240 in terms of footprint, but it is slightly shorter. Neither of these robot mops comes with a huge number of accessories. They simply include the basics to get up and running, with a few bells and whistles to make your cleaning experience easier. You can purchase additional disposable cleaning pads or washable cleaning pads, as needed. As you can see, the cleaning pads and navigation are the real difference makers here. The 380t comes with reusable pads that are machine washable and the inclusion of the Northstar navigation cube is a great feature, especially for cleaning larger or open concept spaces. In terms of cleaning, the Braava 380t is just overall a better cleaner. It can clean larger areas and provide a higher quality clean. But the Braava Jet 240 comes in at a lower cost— so you’ve got to consider, what’s the deal maker or breaker for you? The tests below are all conducted in the Modern Castle home lab, where we test against everyday dirt and grime in a controlled environment for quality testing purposes. For both of these mops, we set up a testing area with three different kinds of messes—soda, mud, and honey. We selected these particular substances because of their inherent range of stickiness. One thin (yet somewhat sticky) mess with the soda. A thick and somewhat caked-on mess with the mud. And we have one very thick (and extremely sticky) mess with the honey. For more detailed cleaning testing data please see our standalone Braava Jet 240 review and Braava 380t review. The performance of the Braava Jet 240 was pretty decent. It did pretty well mopping up the mud, but the honey and soda were less successful. To loosen the honey, the Braava Jet 240 tried spraying extra solution and using its Triple Pass vibrating head to really scrub it clean. While this extra attention did help a little, it wasn’t able to get it completely clean. Did it handle the soda well? The soda was even less successful, in that there was simply too much liquid for the cleaning pad to soak up. It did a decent job cleaning it up initially, but once the pad reached its capacity of liquid, it simply spread the remaining soda around. The mopping performance of the Braava 380t was significantly better than the performance of the Braava Jet 240. The conditions before the test are the same as the conditions were before the Braava Jet 240 (see photo on the upper left). As you compare the after photos between the two models, you can see that the Braava 380t did a substantially better job of cleaning all the messes, but it did have its shortcomings. But what about mud & honey? The 380t tackled it like a real champ, cleaning nearly 100% of each mess across our testing lane. Even the soda, which was a real struggle for the preceding Braava Jet 240, was hardly a match for the Braava 380t. One area where you can see a little bit of struggle is with the corners. If you look at the upper right, you can see a little extra soda that the 380t was not able to capture. In all fairness, neither the Braava Jet 240 nor the Braava 380 is designed to tackle large messes, like 3 oz (or a small glass) of soda being spilled on the floor. With messes like this, we would recommend hitting it with a paper towel first to get the majority of the liquid up before sending your Braava to finish the job. Braava after 30 minutes of dry cleaning on a larger wood floor area. Also, the results of these cleaning tests are not to show that the Braava Jet 240 is a terrible cleaner—that’s not the case. Our test is designed to show extreme cases of messy debris. For light, everyday cleaning of a smaller space, the Braava Jet 240 could easily tackle the job. For homes with bigger messes, higher traffic, or simply a larger footprint, the Braava 380t is likely going to be more equipped to handle itself. If you tend to have large-scale messes (big spills, stuck on food, floors that need sanitizing, etc.) you may be better off with a more traditional mop or steam mop. RELATED: Our best mop guide can help you find what you need. If the Braava mops aren’t what you’re looking for, we were particularly impressed with the O-Cedar EasyWring spin mop, Shark Genius Pocket, and Hoover Twin Tanks. We’ve got full reviews on all of those here. Are Braava Mops Easy to Use? Regarding usability, I would say that both of these models are relatively easy. There are just a few simple steps after initial setup and you’re ready to clean. Fill the reservoir with water or cleaning agent. There are no fancy wifi capabilities to control with your smartphone or even remote control like some other robot vacuums have. The Braava mopping robots also will not drive themselves back to a “home” charging base. When the cleaning cycle is done, you’ll need to track it down and charge the battery manually. All things considered, this isn’t really a big deal. After all, you’ll likely have to refill the tank reservoir as well before starting a new cleaning cycle anyway. What Are the Costs to Maintain the Braava? Maintenance costs are one area that can really add up when considering a robot mop. In some cases, costly accessories, filters, and most importantly, a battery, can really add up and make owning a robot vacuum quite expensive over the long haul. Luckily, this isn’t the case with the Braava lineup. With both models, the main costs are the costs associated with replacing the cleaning pad and battery. In the case of the Braava Jet 240, you’ll need to replace the cleaning pad more since they are disposable. Of course, to save a considerable amount of money, you could also skip the costly replacement pads and just buy a washable set of cleaning pads which could easily last the lifetime of the unit. In comparison, the maintenance costs of the Braava 380t are equally as low. Again, the main expense is going to be replacing the battery, as the cleaning pads that are included with this model are already washable. Both the Braava Jet 240 and the Braava 380t will run you about $5 / year in annual maintenance costs. The Braava Jet 240 may be considerably higher if you choose to forgo the replacement pads and purchase their costly replacement pads. The Braava 380t can run for up to 210 minutes for dry sweeping or up to 150 minutes for wet mopping. By comparison, the Braava Jet 240 can run for up to 180 minutes. Concerning overall lifespan of the battery, both batteries are said to last for 2-3 years before needing to be replaced. Are Braava Mops A Good Value? So here’s the million-dollar-question: are the Braava mopping robots a good value? And if so, which one is better? As with most things, the overall value of any product is largely determined by the value that the user puts on the task that it can do. If you do not enjoy mopping, don’t have the time, or just want a little robot to zoom around and do it for you, these little automated mops certainly bring a lot to the table. Let’s start with the Braava Jet 240. This robot mop value is pretty good, in my opinion. It’s reasonably priced, however, it did struggle with some of our more intense cleaning tests. The 240 is great to maintain floors and handle light to moderate cleaning tasks. Next, onto the Braava 380t. In my mind, it’s no question that the Braava 380t is better than the 240. However, it’s also more expensive. Nevertheless, I would still say its overall value is great. 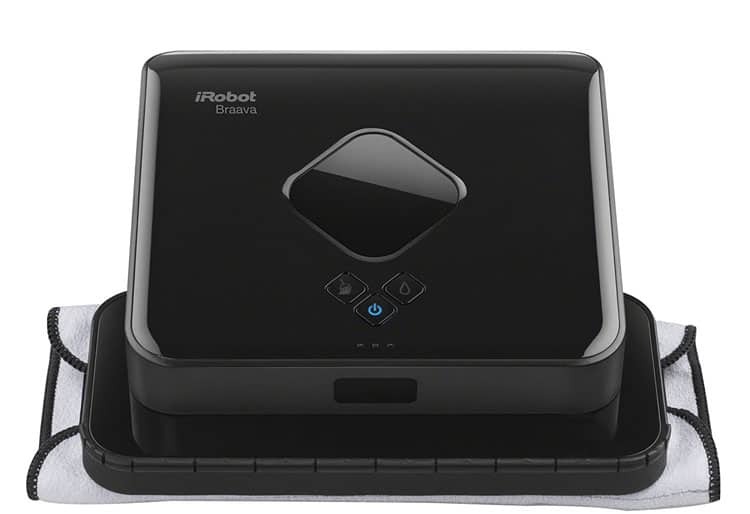 It’s easily one of the best robot mops on the market. It’s able to cover a lot of ground for one charge, offers excellent navigation through the Northstar cube, and is able to handle larger messes and debris that is more stuck on. Is Braava Jet 240 or 380t Best? Depending on the size of your space and severity of your messes, both of these Braava models can be strong contenders to have in your home. Let’s not ignore their noticable differences. Check out the key differences below and see which model is best for you. The Braava Jet 240 comes with basic navigation, while the Braava 380t is equipped with the Northstar cube that acts as a navigational beacon when operating around larger or more complex spaces. If you’ve got a larger home, the Braava 380t is going to take the cake here. Regarding coverage, the Braava 380t can tackle up to 1000 sq ft. when dry sweeping or 350 sq ft. when wet mopping. By comparison, the Braava Jet 240 can only handle approximately 150 sq ft. when wet mopping and 250 sq ft. when dry sweeping. Again, for larger areas, the Braava 380t is a true contender. The cleaning performance of the Braava Jet 240 was not bad by any means, but for our tests, it simply wasn’t at the same level as the 380t. The Braava 380t cleaned considerably better, faster, and longer. If you’re looking specifically at cost and are just looking for a simple robot mop to tackle light messes, the Braava 240 could certainly be the mop for you. It’s less expensive, very user-friendly and inexpensive to operate (assuming you don’t buy the pricey disposable cleaning pads). Should You Buy the Braava Jet 240 Robot Mop? To learn more about the Braava Jet 240, check it out on Amazon here. Should You Buy the Braava 380t Robot Mop? To learn more about the Braava 380t, check it out on Amazon here. April 18, 2019 – Improved formatting, made a few minor updates, and added an update section regarding the Braava Jet 240. March 17, 2019 – Overhauled page layout and design.